One in five people are born with the trait of high sensitivity. Yet, there is a general lack of awareness of the trait in our society, which leaves many people struggling physically, emotionally, mentally and spiritually with being highly sensitive in a non-sensitive world. More often than not, HSPs are yearning for acceptance of their trait. 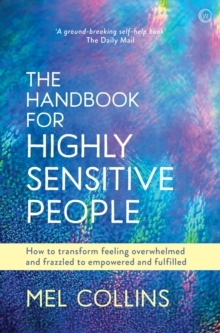 When they realize their sensitivity is `normal' and it's acknowledged in a positive way, a deep sense of relief arises and they can start to flourish - feeling empowered to bring their unique abilities of empathy, compassion, creativity, healing and much more into the world.The book starts by exploring the main qualities and challenges of the trait - including both the reasons for these and the impact that they have. The invaluable second section then provides a wide range of practical strategies to manage the trait more effectively, from more self-love, coping with over-arousal, tapping for emotional freedom, energy protection, dealing with loss and bereavement, and tuning into the healing power of animals. And the final section touches on the more spiritual aspect of life that many HSPs are searching for, whether knowingly or not - from exploring past lives to getting help from the unseen world, such as angels - in their quest to fully accept themselves, and to live the authentic, fulfilling lives they deserve.